The search for new antimicrobials should take into account drug resistance phenomenon. Medicinal plants are known as sources of potent antimicrobial compounds including flavonoids. The objective of this investigation was to evaluate the antimicrobial activities of flavonoid glycosides from Graptophyllum grandulosum, as well as to determine their mechanism of antibacterial action using lysis, leakage and osmotic stress assays. The plant extracts were prepared by maceration in organic solvents. Column chromatography of the n-butanol extract followed by purification of different fractions led to the isolation of five flavonoid glycosides. The antimicrobial activities of extracts/compounds were evaluated using the broth microdilution method. The bacteriolytic activity was evaluated using the time-kill kinetic method. The effect of extracts on the red blood cells and bacterial cell membrane was determined by spectrophotometric methods. Chrysoeriol-7-O-β-D-xyloside (1), luteolin-7-O-β-D-apiofuranosyl-(1 → 2)-β-D-xylopyranoside (2), chrysoeriol-7-O-β-D-apiofuranosyl-(1 → 2)-β-D-xylopyranoside (3), chrysoeriol-7-O-α-L-rhamnopyranosyl-(1 → 6)-β-D-(4"-hydrogeno sulfate) glucopyranoside (4) and isorhamnetin-3-O-α-L-rhamnopyranosyl-(1 → 6)-β-D-glucopyranoside (5) were isolated from G. grandulosum and showed different degrees of antimicrobial activities. Their antibacterial activities against multi-drug-resistant Vibrio cholerae strains were in some cases equal to, or higher than those of ciprofloxacin used as reference antibiotic. 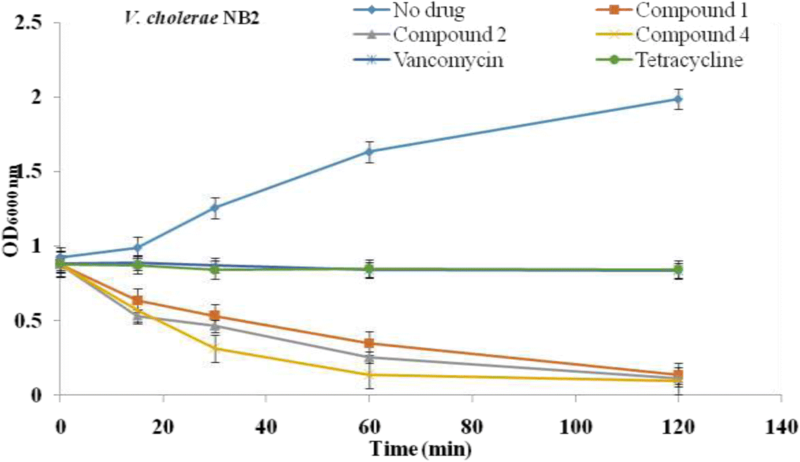 The antibacterial activities of flavonoid glycosides and chloramphenicol increased under osmotic stress (5% NaCl) whereas that of vancomycin decreased under this condition. V. cholerae suspension treated with flavonoid glycosides, showed a significant increase in the optical density at 260 nm, suggesting that nucleic acids were lost through a damaged cytoplasmic membrane. A decrease in the optical density of V. cholerae NB2 suspension treated with the isolated compounds was observed, indicating the lysis of bacterial cells. The tested samples were non-toxic to normal cells highlighting their good selectivity index. The results of the present study indicate that the purified flavonoids from G. glandulosum possess antimicrobial activities. Their mode of antibacterial activity is due to cell lysis and disruption of the cytoplasmic membrane upon membrane permeability. The development of resistance by microorganisms to existing antimicrobial agents has been known for a long time. In several findings, the emergence of multidrug resistant strains of Vibrio cholerae O1 and Shigella flexneri has been reported due to different genetic factors including transfer of plasmids, integrons and allelic variation in the specific genes . In developing countries, fluoroquinolones, widely used for the treatment of many bacterial diseases, including cholera and shigellosis, could contribute to the emergence of multidrug resistance among potential enteric pathogens. Although significant progress has been made in microbiological research and in the control of many diseases caused by infectious microorganisms, recurrent epidemics due to drug-resistant microorganisms as well as the appearance of new microbial pathogenic strains demand the discovery of new antibiotics. The need for ecologically safe compounds as therapeutic agents against drug-resistant microorganisms has driven many studies toward medicinal plants. Literature shows thousands of plant species that have been tested in vitro against many fungal and bacterial strains, and a good number of medicinal plant extracts and pure compounds have now been proven to be active against fungi, Gram-positive and Gram-negative bacteria [2–5]. Medicinal plants contain therapeutic amount of secondary metabolites including flavonoids. These are polyphenolic and C6-C3-C6 compounds in which the two C6 groups are substituted benzene rings, and the C3 is an aliphatic chain which contains a pyran ring . They occur as O- or C-glycosides or in the free state as aglycones with hydroxyl or methoxyl groups . The sugar moiety is an important factor determining their bioavailability. Flavonoids may be divided into seven types: flavones, flavonols, flavonones, flavanes, isoflavones, biflavones and chalcones . Flavonoids are well documented for their pharmacological effects, including antimicrobial, anticancer, antiviral, antimutagenic and antiinflammatory activities [9–11]. Biological properties of flavonoids are linked to their ability to act as strong antioxidants and free radical scavengers, to chelate metals, and to interact with enzymes, adenosine receptors and biomembranes . Graptophyllum glandulosum Turrill (Acanthaceae) is a shrub with 4-angled, nearly glabrous branches, normal green leaves, and red-purple flowers 1 in. or more long. It is one of several shrubs and trees of Graptophyllum that mainly grow in West and Central Africa but also in the pacific regions . This plant contains some important secondary metabolites such as polyphenols, flavonoids and glycosides . Leaves, roots and other parts of G. glandulosum, are used in folk medicine in Cameroon to treat wounds, abscesses, skin diseases, respiratory tract infections and diarrhea. Medical importance of this plant attracted us to explore its antimicrobial properties. Although several ethnobotanical reports have emphasized the pharmacological importance of this species for conditions that appear to be associated with microbial infections, there is very limited literature concerned with the identification of the antimicrobial compounds from this plant. However, a few reports on the in vitro antimicrobial activity of plants have been published [14, 15]. The objective of this investigation was to evaluate the antimicrobial activities of flavonoid glycosides from G. grandulosum, as well as to determine their mechanism of action using lysis, leakage, and osmotic stress assays. A Schorpp Gerätetechnik (Germany) apparatus was used to take the melting points of different compounds. The 1D (1H and 13C-NMR) and 2D (COSY, NOESY, HSQC and HMBC) spectra were performed in deuterated solvents (CD3OD) on Bruker Avance III 600 spectrometer at 600 MHz/150 MHz. All chemical shifts (δ) are given in ppm units with reference to tetramethylsilane (TMS) as internal standard and the coupling constants (J) are in Hz. The mass spectra (HR-TOFESIMS) were carried out on Micromass Q-TOF micro instrument (Manchester, UK). Samples were introduced by direct infusion in a solution of MeOH at a rate of 5 μL/min. Silica gel 60 Merck, 70–230 mesh and sephadex LH-20 were used to perform column chromatography while precoated silica gel 60 F254 (Merck) plates, were used to perform thin layer chromatography. The spots were visualized by an UV lamp multiband UV-254/365 nm (ModelUVGL-58 Upland CA 91786, U.S.A) followed by spraying with 50% H2SO4 and heating at 100 °C for 5 min. The aerial parts of G. grandulosum were harvested in a small village called Foto situated in the Menoua Division, Western region of Cameroon) in November 2015. The Plant was identified and authenticated by a Cameroonian Botanist (Mr. Fulbert Tadjouteu) at the National Herbarium where a voucher specimen was archived (No 65631/HNC). The extraction and isolation of compounds were done as previously described . Briefly, the aerial part of G. grandulosum was air-dried and powdered. The powder was macerated at room temperature with MeOH to afford the MeOH extract. Part of this extract (235 g) was suspended in water (300 mL) and successively partitioned with EtOAc and n-BuOH to yield 37 and 13 g of extracts, respectively. Column chromatography of the n-BuOH extract followed by purification of different fractions led to the isolation of five compounds. The structures of isolated compounds were determined after interpretation of their physical, spectrometric and spectroscopic data summarized in this subsection. Chrysoeriol-7-O-β-D-xyloside (1): yellow amorphous powder; molecular formula C21H20O10; 13C NMR (CD3OD, 150 MHz) δC: 165.3 (C-2), 104.3 (C-3), 184.1 (C-4), 161.7 (C-5), 99.6 (C-6), 163.1 (C-7), 95.8 (C-8), 158.5 (C-9), 107.0 (C-10), 123.1 (C-1′), 110.5 (C-2′), 148.2 (C-3′), 151.0 (C-4′), 116.7 (C-5′), 121.9 (C-6′), 55.2 (C-7′) for aglycone; 100.9 (C-1′′), 74.4 (C-2′′), 77.3 (C-3′′), 70.7 (C-4′′), 66.9 (C-5′′) for sugar moiety. 1H NMR data (CD3OD, 600 MHz) δH: 6.62 (1H, s, H-3), 6.38 (1H, d, J = 2.1 Hz, H-6), 6.71 (1H, d, J = 2.1 Hz, H-8), 7.44 (1H, d, J = 2.1 Hz, H-2′), 6.84 (1H, d, J = 8.4 Hz, H-5′), 7.47 (1H, dd, J = 8.4 and 2.1 Hz, H-6′), 3.87 (3H, s, H-7′) for aglycone; 4.95 (1H, d, J = 7.1 Hz, H-1′′), 3.37 (1H, m, H-2′′), 3.36 (1H, m, H-3′′), 3.49 (1H, m, H-4′′), 3.38 (1H, m, H-5′′a), 3.87 (1H, m, H-5′′b) for sugar moiety. Luteolin-7-O-β-D-apiofuranosyl-(1 → 2)-β-D-xylopyranoside (2): yellow powder; molecular formula C25H26O14. m.p. = 203 °C. 13C NMR data (CD3OD, 150 MHz) δC: 165.3 (C-2), 103.5 (C-3), 182.5 (C-4), 162.9 (C-5), 99.7 (C-6), 163.1 (C-7), 94.9 (C-8), 157.4 (C-9), 105.5 (C-10), 121.7 (C-1′), 114.2 (C-2′), 146.4 (C-3′), 150.5 (C-4′), 116.6 (C-5′), 119.7 (C-6′) for aglycone; 99.0 (C-1′′), 76.0 (C-2′′), 77.0 (C-3′′), 70.0 (C-4′′), 66.1 (C-5′′), 109.3 (C-1′′′), 76.5 (C-2′′′), 79.7 (C-3′′′), 64.5 (C-4′′′), 74.4 (C-5′′′) for sugar moiety. 1H NMR data (CD3OD, 600 MHz) δH: 6.75 (1H, s, H-3), 6.40 (1H, d, J = 2.1 Hz, H-6), 6.75 (1H, d, J = 2.1 Hz, H-8), 7.44 (1H, d, J = 2.1 Hz, H-2′), 6.90 (1H, d, J = 8.4 Hz, H-5′), 7.47 (1H, dd, J = 8.4 and 2.1 Hz, H-6′) for aglycone; 5.18 (1H, d, J = 7.1 Hz, H-1′′), 3.52 (1H, dd, J = 9.0 and 7.1 Hz, H-2′′), 3.43 (1H, m, H-3′′), 3.41 (1H, m, H-4′′), 3.78 (1H, dd, J = 9.7 and 3.4 Hz, H-5′′a), 3.42 (1H, dd, J = 9.7 and 3.4 Hz, H-5′′b), 5.34 (1H, d, J = 1.3 Hz, H-1′′′), 3.75 (1H, m, H-2′′′), 3.30 (2H, d, J = 3.4 Hz, H-4′′′), 3.88 (1H, d, J = 9.3 Hz, H-5′′′a), 3.65 (1H, d, J = 9.3 Hz, H-5′′′b) for sugar moiety. Chrysoeriol-7-O-β-D-apiofuranosyl-(1 → 2)-β-D-xylopyranoside (3): yellow powder; molecular formula C26H28O4; melting point = 181.8 °C. 13C NMR (CD3OD, 150 MHz) δC: 166.6 (C-2), 104.5 (C-3), 184.0 (C-4), 162.9 (C-5), 100.9 (C-6), 164.4 (C-7), 95.9 (C-8), 158.9 (C-9), 107.0 (C-10), 123.4 (C-1′), 110.4 (C-2′), 149.5 (C-3′), 152.3 (C-4′), 116.7 (C-5′), 121.9 (C-6′), 56.6 (C-7′) for aglycone; 100.6 (C-1′′), 78.6 (C-2′′), 77.9 (C-3′′), 70.9 (C-4′′), 66.9 (C-5′′), 110.0 (C-1′′′), 78.1 (C-2′′′), 80.7 (C-3′′′), 65.8 (C-4′′′), 75.4 (C-5′′′) for sugar moiety. 1H NMR data (CD3OD, 600 MHz) δH: 6.70 (1H, s, H-3), 6.45 (1H, d, J = 2.1 Hz, H-6), 6.77 (1H, d, J = 2.1 Hz, H-8), 7.52 (1H, d, J = 2.1 Hz, H-2′), 6.95 (1H, d, J = 8.4 Hz, H-5′), 7.56(1H, dd, J = 8.4 and 2.1 Hz, H-6′), 3.98 (3H, s, H-7′) for aglycone; 5.16 (1H, d, J = 7.1 Hz, H-1′′), 3.68 (1H, dd, J = 9.0 and 7.1, H-2′′), 3.63 (1H, m, H-3′′), 3.62 (1H, m, H-4′′), 3.98 (1H, m, H-5′′a), 3.48 (1H, t, J = 9.6, H-5′′b), 5.46 (1H, d, J = 1.7 Hz, H-1′′′), 3.98 (1H, m, H-2′′′), 3.56 (2H, brs, H-4′′′), 4.05 (1H, d, J = 9.4, H-5′′′a), 3.84 (1H, d, J = 9.4, H-5′′′b) for sugar moiety. Chrysoeriol-7-O-α-L-rhamnopyranosyl-(1 → 6)-β-D-(4′′-hydrogenosulfate) glucopyranoside (4): yellow amorphous powder; molecular formula C28H31NaO18S. 13C NMR data (CD3OD, 150 MHz) δC: 166.8 (C-2), 104.5 (C-3), 184.1 (C-4), 163.1 (C-5), 101.1 (C-6), 164.0 (C-7), 96.2 (C-8), 159.0 (C-9), 107.2 (C-10), 123.6 (C-1′), 110.8 (C-2′), 149.6 (C-3′), 152.3 (C-4′), 116.9 (C-5′), 122.0 (C-6′), 56.7 (C-7′) for aglycone; 100.9 (C-1′′), 74.5 (C-2′′), 76.8 (C-3′′), 77.5 (C-4′′), 75.3 (C-5′′), 67.1 (C-6′′), 102.4 (C-1′′′), 71.9 (C-2′′′), 72.3 (C-3′′′), 74.2 (C-4′′′), 69.8 (C-5′′′), 17.9 (C-6′′′) for sugar moiety. 1H NMR data (CD3OD, 600 MHz) δH: 6.73 (1H, s, H-3), 6.56 (1H, d, J = 2.1 Hz, H-6), 6.84 (1H, d, J = 2.1 Hz, H-8), 7.55 (1H, d, J = 2.1 Hz, H-2′), 6.98 (1H, d, J = 8.4 Hz, H-5′), 7.59 (1H, dd, J = 8.4 and 2.1 Hz, H-6′), 3.99 (3H, s, H-7′) for aglycone; 5.15 (1H, d, J = 7.8 Hz, H-1′′), 3.61 (1H, dd, J = 9.1 and 7.8 Hz, H-2′′), 3.84 (1H, t, J = 9.1 Hz, H-3′′), 4.32 (1H, dd, J = 9.9 and 9.1 Hz, H-4′′), 3.89 (1H, m, H-5′′), 4.10 (1H, m, H-6′′a), 3.68 (1H, m, H-6′′b), 4.75 (1H, d, J = 1.3 Hz, H-1′′′), 3.95 (1H, dd, J = 3.4 and 1.3, H-2′′′), 3.72 (1H, dd, J = 9.5 and 3.4 Hz, H-3′′′), 3.32 (1H, t, J = 9.5 Hz, H-4′′′), 3.62 (1H, m, H-5′′′), 1.21 (3H, d, J = 6.2 Hz, H-6′′′) for sugar moiety. Isorhamnetin-3-O-α-L-rhamnopyranosyl-(1 → 6)-β-D-glucopyranoside (5): yellow amorphous powder; molecular formula C28H32O15. 13C NMR data (CD3OD, 150 MHz) δC: 159.8 (C-2), 135.7 (C-3), 179.8 (C-4), 162.4 (C-5), 104.3 (C-6), 160.1 (C-7), 100.2 (C-8), 157.5 (C-9), 108.6 (C-10), 123.0 (C-1′), 114.5 (C-2′), 148.4 (C-3′), 151.1 (C-4′), 116.2 (C-5′), 124.4 (C-6′), 56.7 (C-7′) for aglycone; 104.0 (C-1′′), 75.9 (C-2′′), 78.1 (C-3′′), 71.8 (C-4′′), 77.4 (C-5′′), 68.7 (C-6′′), 102.6 (C-1′′′), 72.1 (C-2′′′), 72.3 (C-3′′′), 73.8 (C-4′′′), 69.8 (C-5′′′), 18.0 (C-6′′′) for sugar moiety. 1H NMR data (CD3OD, 600 MHz) δH: 6.71 (1H, d, J = 2.2 Hz, H-6), 7.09 (1H, d, J = 2.2 Hz, H-8), 7.91 (1H, d, J = 2.2 Hz, H-2′), 6.95 (1H, d, J = 8.5 Hz, H-5′), 7.72 (1H, dd, J = 8.5 and 2.2 Hz, H-6′), 3.98 (3H, s, H-7′) for aglycone; 5.30 (1H, d, J = 7.6 Hz, H-1′′), 3.49 (1H, dd, J = 9.1 and 7.6 Hz, H-2′′), 3.45 (1H, t, J = 9.1 Hz, H-3′′), 3.23 (1H, t, J = 9.1 Hz, H-4′′), 4.40 (1H, m, H-5′′), 3.84 (1H, dd, J = 12.1 and 1.9 Hz, H-6′′a), 3.42 (1H, m, H-6′′b), 4.53 (1H, d, J = 1.3 Hz, H-1′′′), 3.58 (1H, dd, J = 3.4 and 1.3, H-2′′′), 3.47 (1H, dd, J = 9.5 and 3.4 Hz, H-3′′′), 3.25 (1H, t, J = 9.5 Hz, H-4′′′), 3.41 (1H, m, H-5′′′), 1.10 (3H, d, J = 6.2 Hz, H-6′′′) for sugar moiety. The microorganisms used in this study were consisted of five bacterial strains namely Staphylococcus aureus ATCC 25923, Vibrio cholerae NB2, PC2, SG24 (1) and CO6 . Also included were two fungi Candida albicans ATCC 9002 and Cryptococcus neoformans IP95026. These bacteria and yeasts were obtained from our local stocks. The minimum inhibitory concentration (MIC) values were determined using the broth micro-dilution method as described earlier . The MIC values were defined as the lowest sample concentration that prevented the change in color indicating a complete inhibition of microbial growth. The lowest concentrations that yielded no growth after the subculturing were taken as the minimum microbicidal concentration (MMC) values . Ciprofloxacin (Sigma-Aldrich, Steinheim, Germany) and amphotericin B (Merck, Darmstadt, Germany) were used as positive controls for bacteria and yeast respectively. Osmotic stress was induced by adding 5% NaCl (w/v) to MHB. The MHB supplemented with 5% NaCl was then sterilized and used for the determination of a new MIC and MBC values of the samples as previously described . The incubation time was increased from 24 to 48 h at 37 °C. The alteration of cell membrane of V. cholerae NB2 was evaluated by measuring the optical densities at 260 nm of the bacterial suspensions in the presence and absence of compounds 1–5 using the method described by Carson et al. . For this purpose, the compounds were tested at their MIC using 1 mL of the bacterial suspension (approximately 108 CFU/mL). The mixture was then incubated at 37 °C at different time intervals (0: immediately after addition of the compound; 15; 30; 60 min), 50 μL of the mixture was taken and mixed with 1.95 mL of Phosphate Buffered Saline (PBS Buffer). The absorbance was measured on the spectrophotometer at 260 nm against the blank (PBS). For the negative control, 1 mL of bacterial suspension was incubated at 37 °C and 50 μL of the suspension was removed at the end of the various incubation times and mixed with 1.95 mL of Buffer. The optical densities were read in the same way. The bacteriolytic activities of the isolated compounds were determined using the time-kill kinetic method as previously described  with slight modifications. Full growth of V. cholerae NB2 in MHB was diluted 100 times and incubated at 37 °C to produce an OD600 of 0.8 as starting inoculum. Sample solutions were added to the starting bacterial suspension to give a final concentration of 2 × MIC and incubated at 37 °C with shaking, then 100 μL was removed from each tube at 0, 15, 30, 60, and 120 min and the optical density measured at 600 nm. Vancomycin and tetracycline were used as positive controls and the tubes without isolated compounds served as negative controls. Whole blood (10 mL) from albino rats was collected by cardiac puncture in EDTA tubes. The study was conducted according to the ethical guidelines of the Committee for Control and Supervision of Experiments on Animals (Registration no. 173/CPCSEA, dated 28 January, 2000), Government of India, on the use of animals for scientific research. Erythrocytes were harvested by centrifugation at room temperature for 10 min at 1000 x g and were washed three times in PBS buffer . The cytotoxicity was evaluated as previously described . Data were analyzed by one-way analysis of variance followed by Waller-Duncan post hoc test. The experimental results were expressed as the mean ± Standard Deviation (SD). Differences between groups were considered significant when p < 0.05. All analyses were performed using the Statistical Package for Social Sciences (SPSS, version 12.0) software. 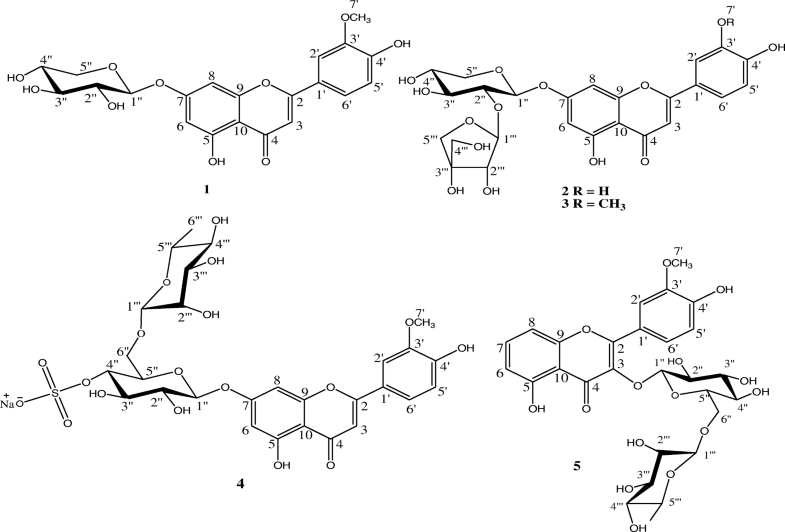 The structures of five known flavonoid glycosides isolated from the n-BuOH fraction of leaves of G. grandulosum (Fig. 1) were determined using spectroscopic analysis and NMR spectra in conjunction with 2D experiments (COSY, NOESY, HSQC and HMBC). Direct comparison with published information led to the identification of chrysoeriol-7-O-β-D-xyloside 1 , luteolin-7-O-β-D-apiofuranosyl-(1 → 2)-β-D-xylopyranoside 2 , chrysoeriol-7-O-β-D-apiofuranosyl-(1 → 2)-β-D-xylopyranoside 3 , chrysoeriol-7-O-α-L-rhamnopyranosyl-(1 → 6)-β-D-(4′′-hydrogeno sulfate) glucopyranoside 4  and isorhamnetin-3-O-α-L-rhamnopyranosyl-(1 → 6)-β-D-glucopyranoside 5 . The in vitro activities of MeOH, n-BuOH and EtOAc extracts as well as their isolated compounds against pathogenic bacteria and fungi are presented in Table 1. The test samples demonstrated varying degrees of inhibitory activities against the bacterial and fungal strains. Fungal strains were generally more susceptible to the effects of the compounds, but less susceptible to extracts. The EtOAc and n-BuOH extracts were active against C. albicans and C. neoformans which were not susceptible to the MeOH extract. The MIC values obtained with the EtOAc and n-BuOH extracts were smaller than those obtained with the MeOH extract. These observations suggest that the fractionation of the MeOH extract enhanced its antimicrobial activity. The lowest MIC values were recorded on S. aureus; suggesting that this microorganism was the most susceptible to all the test samples. The EtOAc extract showed the highest antimicrobial activity when compared with the MeOH and n-BuOH extracts. The antimicrobial activities of the isolated compounds from G. glandulosum were as follows: compound 4 > compound 1 > compound 2 > compound 5 > compound 3. The lowest MIC value of 4 μg/mL was recorded on C. neoformans with compound 4 and on S. aureus with compounds 1, 2 and 4 whereas the lowest MMC value was obtained on S. aureus with compound 4. However, the highest MIC value for compounds (64 μg/mL) was recorded with compound 3 against V. cholerae CO6, and with compounds 2 and 5 against C. albicans, while the highest MBC value of 128 μg/mL was obtained on V. cholerae CO6 with compound 3 and on C. albicans with compound 5. The MIC values of flavonoid glycosides against Gram-negative and Gram-positive bacteria are reported in Table 2. The results clearly showed that the MIC values of flavonoid glycosides obtained under osmotic stress (in the presence of 5% NaCl) are smaller than those obtained under normal conditions (0% NaCl). This result suggests an increase in the activity of purified flavonoid glycosides under osmotic stress. As demonstrated under normal condition, compound 4 was still the most effective under osmotic stress, followed in decreasing order by compounds 1 and 2. 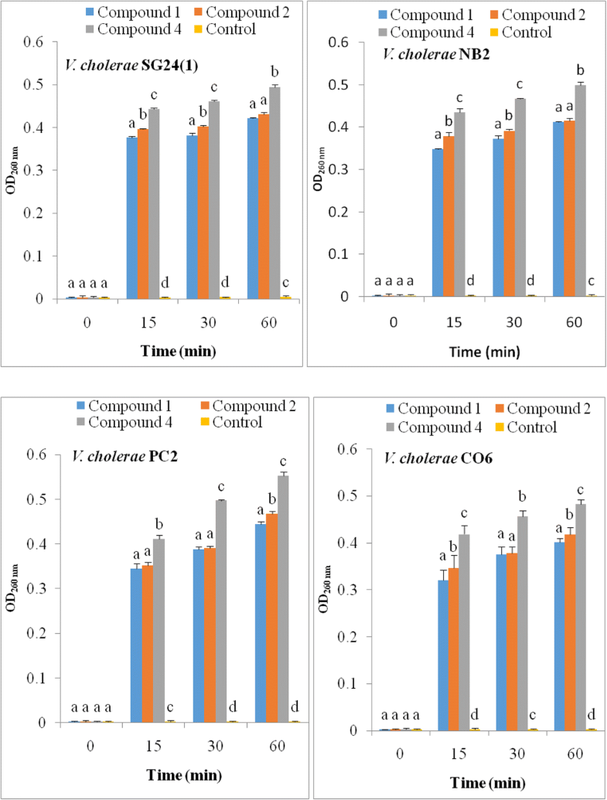 The MIC values of chloramphenicol determined under osmotic stress condition were smaller than those determined under normal conditions. However, all the MIC values of vancomycin determined under osmotic stress were higher than those determined under normal conditions. Table 1 further shows that under osmotic stress, the antibacterial activities of compounds 1, 2 and 4 against V. chorae SG24 (1), V. chorae CO6, V. chorae NB2 and V. chorae PC2 were higher than that of vancomycin. The effect of flavonoid glycosides of G. glandulosum was evaluated in terms of leakage of UV 260 absorbing material through the bacterial cell membrane (Fig. 2). After treatment with flavonoid glycosides at MIC values of compounds 1, 2 and 4, the OD260 values of filtrates of all test strains increased and most of the leakage occurred during the initial period (≤ 15 min), followed by a slight increase with prolonged incubation period. At the same time, the OD260 of the control without compound was not changed. These results suggest that flavonoid glycosides from G. glandulosum damage the cytoplasmic membrane and cause loss of intracellular components. The highest values of OD260 were recorded with compound 4 for all the V. cholerae strains, whereas the least OD260 values were noticed with compound 2, indicating that compound 4 released the highest amounts of nucleic acids followed in decreasing order by compound 1, then 2. The result on the leakage of 260 nm absorbing material was consistent with that of bacteriolysis (Fig. 3). This result showed a decrease in the optical density of suspension treated with compounds 1, 2 and 4. After 120 min, compounds 1, 2 and 4 induced a decline in cell turbidity of 93.20, 94.36 and 95.16%, respectively in bacteria suspension compared to time 0, indicating the lysis of bacterial cells. The haemolytic activities of extracts and compounds 1–5 against red blood cells (RBCs) were investigated using Triton X-100 as a positive control. The positive control showed about 100% lysis, whereas the phosphate buffer saline (PBS) showed no lysis of RBCs. Interestingly, none of the tested samples showed haemolytic activities against RBCs at concentrations up to 256 and 2048 μg/mL for isolated compounds and extracts respectively (results not shown). This finding highlights the fact that the observed biological efficacy was not due to haemolysis. The antimicrobial activity of a plant extract is considered to be highly active if the MIC < 100 μg/mL; significantly active when 100 ≤ MIC ≤512 μg/mL; moderately active when 512 < MIC ≤2048 μg/mL; weakly active if MIC > 2048 μg/mL and not active when MIC > 10,000 μg/mL . Hence, the EtOAc extract of G. glandulosum was highly active (MIC < 100 μg/mL) against V. cholerae SG24 (1), V. cholerae NB2, V. cholerae PC2 and S. aureus; significantly active (100 ≤ MIC ≤512 μg/mL) against V. cholerae CO6 and C. neoformans; moderately active (512 < MIC ≤2048 μg/mL) on C. albicans. The MeOH and n-BuOH extracts were significantly active against the test bacterial species; weakly and moderately active against the yeast cells respectively. In this study, we also investigated if the mode of action of flavonoid compounds is bactericidal or bacteriostatic. The results of the MMC values were fourfold lesser than their corresponding MIC values. This observation suggests that the actions of extracts from G. glandulosum and their isolated flavonoid glycosides were bactericidal . The antibacterial activities of flavonoid glycosides were in some cases equal to, or higher than those of ciprofloxacin used as reference antibiotic, suggesting that they might be effective antibiotics against these pathogenic bacteria. Taking into account the medical importance of the test microbial species, the result can be considered as promising for the development of new antimicrobial drugs. The antimicrobial activities of purified flavonoids corroborated with those of early reports against bacteria and fungi [5, 11, 26–28]. The antibacterial activity of the samples against V. cholerae and S. flexneri are particularly noteworthy since these strains were MDR clinical isolates which were resistant to commonly used drugs such as ampicillin, streptomycin, nalidixic acid, furazolidone and co-trimoxazole [16, 29, 30]. Antimicrobial cutoff points have been defined in the literature to enable the understanding of the effectiveness of pure compounds as follows: highly active: MIC below 1 μg/mL (or 2.5 μM), significantly active: 1 ≤ MIC ≤10 μg/mL (or 2.5 ≤ MIC < 25 μM), moderately active: 10 < MIC ≤100 μg/mL (or 25 < MIC ≤250 μM), weakly active: 100 < MIC ≤1000 μg/mL (or 250 < MIC ≤2500 μM and not active: MIC > 1000 μg/mL (or > 2500 μM) . Based on this, the antimicrobial activities of all the tested flavonoid glycosides could be considered as significant or moderate against the specific microorganisms. The antimicrobial activities of the isolated compounds from G. glandulosum were in this order: compound 4 > compound 1 > compound 2 > compound 5 > compound 3. Very little is known about the structure–function relationships of natural antimicrobials, but it seems that different substituent groups within the compounds had a great influence on their biophysical and biological properties . Structural features such as the presence of an aromatic ring, the sugar moiety or the numbers of hydroxyl and methoxyl groups can significantly change membrane permeability and subsequent affinity to external and internal binding sites in the bacteria, thus influencing the compound’s antimicrobial properties . The antibacterial activities of flavonoid glycosides and chloramphenicol increased under osmotic stress (5% NaCl) whereas that of vancomycin decreased under this condition. The results were supported by the observation that certain bacterial strains (E. coli, S. aureus, P. aeruginosa) can survive under osmotic stress conditions . At low water activity, lipid composition of bacterial cell membrane was changed . This incident might lead to occurrence of more antibacterial binding site on cell membrane of bacteria and cause less resistance to antibacterial substance. Therefore, the presence of the salt triggered changes in the membrane lipid composition. This is possible to increase the antibacterial activity of flavonoid glycosides and chloramphenicol. However, the mechanisms that make bacteria more sensitive to certain antibiotics under osmotic stress conditions are still unknown. The results of vancomycin activity are in agreement with those of McMahon and coworkers  who demonstrated a decrease in the activity of amikacin, ceftriaxone and trimethoprim against E. coli and S. aureus under osmotic stress conditions. Marked leakage of cytoplasmic material is considered indicative of gross and irreversible damaged to the cytoplasmic membrane. Many antibacterial compounds that act on the bacterial cytoplasmic membrane induce the loss of 260 nm-absorbing materials (nucleic acids) including chlorohexidine, hexachlorophene, phenetyl alcohol, tetracycline, polymixin, α-pinene, and lemon grass oil . The V. cholerae suspension treated with flavonoid glycosides, showed a significant increase in the optical density at 260 nm, suggesting that nucleic acids were lost through a damaged cytoplasmic membrane. Our observations confirm that the antimicrobial activity of flavonoid glycosides results from their ability to disrupt the permeability barrier of microbial membrane structures. This mode of action is similar to that of other broad-spectrum, membrane-active disinfectants and preservatives, such as phenol derivatives, chlorohexidine and para benzoic acid derivatives . Furthermore, Devi and Kapila , reported the antibacterial mechanism as disruption of plasma membrane by the phytochemicals in the extracts of Indian liverworts. The fact that flavonoids-induced damage to cell membrane structure accompanied by the decline in the absorbance of bacterial cell suspension treated with compounds has confirmed it as the most likely cause of cell death. Our result is supported by the observation that other flavonoid compounds such as epigallocatechin gallate and galangin induced 3-log reduction or more in viable counts of S. aureus [38, 39]. The results of the present study indicate that the purified flavonoid glycosides from G. glandulosum possess antimicrobial activities. Their mode of antibacterial activity is due to cell lysis and disruption of the cytoplasmic membrane by action upon the membrane permeability leading to leakage of cellular components and eventually cell death. This will lead to improve antimicrobial formulations and to ensure the prevention of the emergence of microbial resistance. However, the possibility remains that sites of action other than the cytoplasmic membrane exist. Further work is required to expatiate fully the mechanisms involved. CNT and SEE contributed to the data collection and analysis. JDT designated the study, did the biological assays and helped in manuscript writing and editing. JDT, DN and LVN supervised and revised the manuscript critically for important intellectual content. All authors read and agreed on the final version of the manuscript.